Have you ever had a situation when you and your friends couldn't divide the meal into equal pieces? Well, this game will give you a chance to practice your slicing skills! Take your chance and cut a tasty cake! Are you tired of games where you have too shoot somebody or pointless adventures? Zombies and fable games bring no satisfaction to you at all? 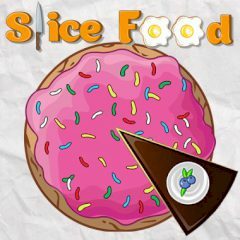 If you want to play something, but have a good and useful experience at the same time, then Slice Food is the game specially for you. Learn the practical ways of dividing the food with your knife into equal pieces!